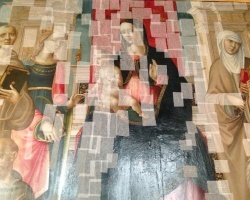 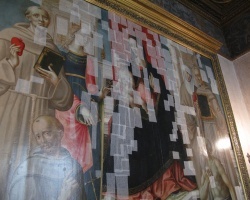 To cleanse a blackened fresco or to prevent an old master painting fromflaking, well tested techniques are used that might confuse a casual visitor, but in any case are rarely seen by the general public. 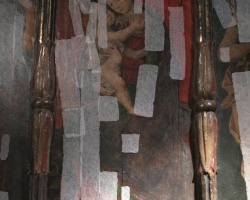 I was surprised how they can favourably change the experience of a mediocre painting, that in other circumstances wouldn’t catch my passing attention, and I was determined, given a chance, to do something visually similar. 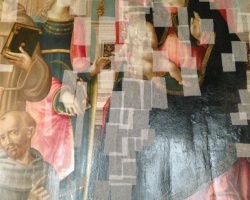 This I experimented with the help of a sympathetic restorer, in 2013, on a 19th century copy of an older religious subject and, three years later, on a ceiling fresco of an uncertain mythological subject.